Update: Sony has launched a Xperia E4 and Xperia E4 smartphones. 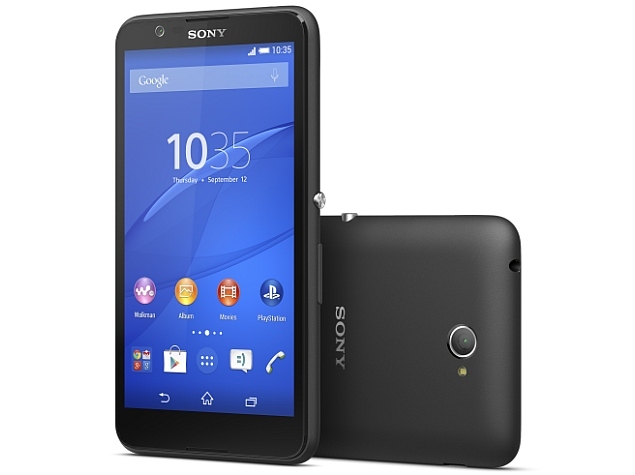 The Sony Xperia E4 features a 5-inch IPS LCD with a qHD (540×960 pixels) display. It is powered by a 1.3GHz quad-core MediaTek MT6582 processor coupled with 1GB of RAM. It bears 8GB of inbuilt storage that is expandable via microSD card. It runs on Android 4.4.4 KitKat OS. On camera front, the Xperia E4 include a 5-megapixel rear camera with LED flash and a 2-megapixel front-facing camera. It has a 2300mAh battery that Sony claims provide two days of battery life. Sony has also included Battery Stamina and Ultra Stamina modes to help. The smartphone features curved edges; a textured back panel, a scratch-resistant display, a diamond-cut aluminium power button, and a stainless steel camera ring. For connectivity, there’re optional dual-SIM, 3G HSPA, Wi-Fi and Bluetooth 4.1. These smartphone will be made available in the middle of February. The Sony Xperia E4 and Sony Xperia E4 Dual will be available in Black and White colour variants. No pricing details have been shared yet by the company. A polish website has recently posted several photos of the alleged Sony Xperia E4. Assuming the photos are accurate, it is a marked departure from the Sony Xperia E3. The Xperia E3 was a low-end handset that looked like any smartphone, but the design of the Xperia E4 says otherwise. The Sony Xperia E3 was just unveiled in September. Apparently, there will be two versions of the E4 available, so customers will be able to choose between Single and Dual-SIM variants. Both handsets will run Android KitKat 4.4 with an assured update to Lollipop. Sony Xperia E4 will have a 5-inch display with a resolution of 540 x 960. It’s powered by a quad-core MediaTek SoC clocked at 1.3GHz and 1GB of RAM Internal storage, cameras, and battery life haven’t been revealed, but it should follow the path set by its predecessor. The specs may be similar, but the design is a bit different as you can see by the rounded edges and slimmer bezels.The E4 also sports what is described as a high quality plastic build, with a ceramic feel. Last month, some photos were leaked that shows the LCD Touch Digitizer for the Sony Xperia Z4. It was showcased alongside its counterpart Sony Xperia Z3. Recently, there was talk that the device will feature a 5.5-inch screen with 1440 x 2560 pixels resolution. However, the leaked photos suggest that the upcoming device will sport a 5.2” inch screen same as Xperia Z3. The report claims that the Xperia E4 will be revealed at MWC in Barcelona in early March 2015. Sony plans for it to hit the market in late March 2015 around the $200 price point.